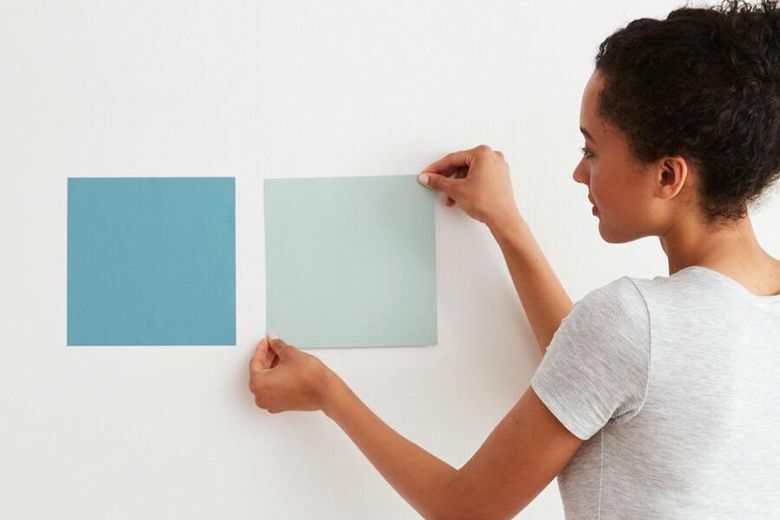 Online paint sellers keep their colors tightly curated and have swapped the sample can for self-adhesive color swatches. In the direct-to-consumer product revolution, all it takes is a few swipes and taps to get house plants, comforters and mattress samples delivered from your Instagram feed directly to your front door. Now two start-ups are vying to turn one of the most powerful — and whined about — home décor purchases on its head. We’ve all been there, staring dumbfounded at a rainbow wall of paint chips wondering where to start. Was that trim color she recommended White Dove or Dune White? How are there so many versions of blue-green, and what in the world does “eggshell” mean, again? Paint and supply companies Clare and Backdrop both launched in 2018 with splashy e-commerce sites, social media feeds and similar price points to their bricks-and-mortar competitors. Rather than selling thousands of colors, they both offer a tightly curated lineup of about 50 low-to-no-VOC (volatile organic compounds) paints. And perhaps most notably, in lieu of providing flimsy paint cards, the companies sell generously sized, self-adhesive color swatches for less than the cost of a sample can. The fan decks, they are a-changin’. Gibbons says an important part of her vision for Clare involved creating a virtual “interior designer BFF” to help people navigate the unnecessarily egregious painting process. Through eight questions, Clare’s Color Genius tool dispenses customized paint recommendations. The site also offers a paint calculator and blog with plenty of how-to advice. For Backdrop’s husband-and-wife co-founders, Caleb and Natalie Ebel, the goal was to totally rethink the way people look at paint. “It’s not a hardware store purchase, it’s an art project on your wall,” Natalie Ebel said. The Ebels say they spent years reimagining everything from the straightforward names of their paints to the twist-top, stainless-steel containers. Caleb, a veteran of Warby Parker, and Natalie, a former nonprofit executive, said they felt it was important to build social impact into their start-up, with a portion of every sale going to the International Rescue Committee. For Elizabeth Rishel, founder of the DIY home lifestyle blog Within the Grove, renovating without having to set foot in a hardware store is an answered prayer. As the mother of a 2-year-old and someone who shops for home goods online via Wayfair and Joss & Main, Rishel says she frequently recommends direct-to-consumer companies to her readers. “The importance of companies like this is they are simplifying the process, which is giving the homeowners the confidence to do it on their own,” Rishel said. Rishel says anyone who is squeamish about shopping this way should browse social media posts to see what kind of outcomes people have had with the products. She also suggests taking advantage of the companies’ attentive customer service. She says that’s one of the major draws of direct-to-consumer brands, especially those with savvy social marketing strategies. Nicki Clendening, owner of Scout Designs in New York City, says the direct-to-consumer shift in the home space represents convenience, but also consumer empowerment. When industries that previously catered more to contractors and designers adjust their strategies to target consumers, the result is a more streamlined and user-friendly sales process. Only time will tell if people love Avocado Toast (the paint color) on their walls as much as they do with their single-origin espressos. Those flimsy paint chips, on the other hand? May they rest in peace.